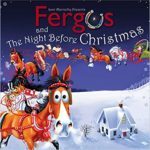 Whether you are 5 or 95, you’ll enjoy Fergus, the world’s most popular cartoon horse, and his holiday adventure inspired by the classic tale ‘Twas the Night Before Christmas. With colorful, light-hearted comedy on every page, Fergus and his motley group of equine teammates bravely take to the skies to give St. Nick the sleigh ride of his life. Can Santa manage his ungainly hitch and deliver the perfect gift on the most magical night of the year? Fasten your seatbelt!